The new line is the latest leg of a high-speed rail network in China’s most developed region. Trains on the network will operate at a speed of 300 kmh, meaning travel time between cities will be halved. The new high-speed railway is expected to boost the region’s economy and increase tourism in the three cities it links. 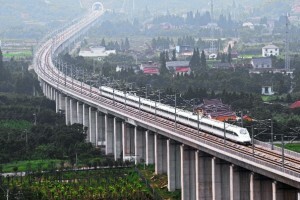 China will invest 520 billion yuan in railway infrastructure this year and 5,200 km of new lines will be put into use.